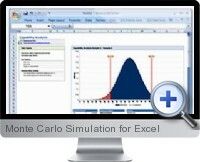 Excel Monte Carlo Simulation (Quantum XL) is an Excel add-in providing fast and easy Monte Carlo analysis and simulation functions to Excel models. The Monte Carlo Simulation add-in also provides adduced data visualization and analysis including optimization, custom distributions, latitude plots and percentage contribution analysis. Comparable to Crystal Ball but at a much lower cost. Monte Carlo simulations can be run in Rocket mode of up to 2 million simulation per second and automatically switches to Native mode depending on resource limitations. Model optimization finds optimal set points for both input and output variables. Optimization criteria statistics are flexible such as defects per million, mean, standard deviation, percentile, median etc. Supports custom discrete and continuous distributions as well as the normal, uniform, triangular, log Normal, logistic, log logistic, gamma, Weibull, exponential, uniform discrete, Poisson, binary and binomial distributions. Input/Output Manager window provides an overview of all inputs, outputs and custom distributions. Define multiple inputs and outputs simultaneously by selecting ranges of cells. Provides percent contribution and tolerance allocation tables to analyze the most sensitive model inputs. Latitude plots provide a graphical representation of the variation being consumed by inputs. Merge two or more legacy model design sheets to create one larger model. Create surface, contour and interaction plots of the model's inputs versus outputs to analyze relationships. Allows entering of part, process and performance information to monitor the capability and maturity of model design and creates Pareto of defects per unit to help allocate critical resources. Creates Latin hypercube samples and descriptive samples for validation strategies. Creates NOLHS designs ideal for multiple level experiments with deterministic simulators. Allows creation and edit of houses of quality, pairwise comparison matrices, FMEA and Pugh matrices.